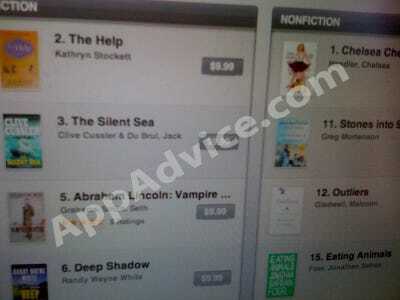 A leaked image of Apple’s iBookstore has hit the web via Alexander Vaughn at App Advice.Alexander says he’s seen the iBookstore first hand. He the top 32 eBook bestsellers are in the store. He says the 27 of them are being sold for $9.99 and the most expensive of the bunch is $12.99. The $9.99 pricepoint is a bit of a stunner. Apple had been suggesting that it would charge $12.99 or $14.99 for e-books. Amazon is charging $9.99 for bestsellers which is making publishers upset. Publishers don’t want e-books being sold at a third the price that new hardcovers go for.